NIA CHARLESTOWN NEVIS (January 05, 2016) — Premier of Nevis Hon. Vance Amory welcomed a visit from St. Kitts and Nevis Resident Ambassador to the Republic of China (Taiwan) Her Excellency Jasmine Huggins at the Nevis Island Administration at Bath Hotel on December 31, 2015. She was at the time spending a day on Nevis accompanied by two of her friends Her Excellency Njabuliso Gwebu, Ambassador of the Kingdom of Swaziland to Switzerland who served with Ambassador Huggins in Taiwan but is now based in Geneva, and businesswoman Ms. Maria Rybicka who resides in Switzerland. In brief comments Mr. Amory applauded their visit to Nevis and urged them to enjoy the island’s unique features. “They have come to see what Nevis is like…We have our qualities which we think are worthy of recognition: our history, our heritage and the warmth and hospitality of our people, I think, unmatched anywhere and I want to just welcome you,” he said. 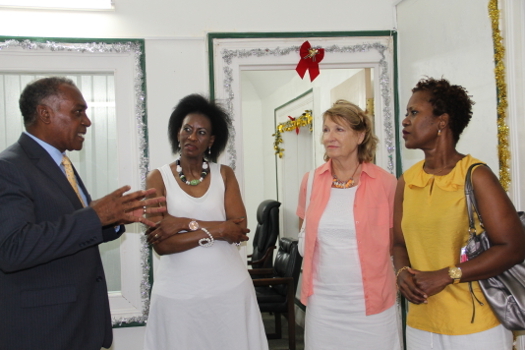 Ambassador Huggins said she was proud to have the opportunity to show off St. Kitts and Nevis to her friends. She echoed the sentiments of Mr. Amory and added that her guests enjoyed the island’s unique heritage, warm and friendly people. She said she was happy to be home to celebrate the Christmas season with family and friends and looks forward to bringing more friends to visit her island home. In response, Ambassador Gwebu acknowledged the Federation’s beauty and the warmth she experienced during her visit to St. Kitts and Nevis. The Ambassador and Ms. Rybicka were guests of the Huggins family who had shown them great generosity and warm hospitality. She said they also had the opportunity to visit a number of the tourist sites on St. Kitts and used the opportunity to extend greetings to the people of St. Kitts and Nevis and applauded Mr. Amory. “We have been occupied and been well fed and I wish the people of Nevis a prosperous 2016 and they have achieved so much and I know there is still more and we thank very much the Premier for taking time out of his busy schedule. “I know at this time of the year there is so much to be done but he makes sure he welcomes everybody from the grass roots. This shows that this is a very good recipe for good governance. When you welcome everyone at any time, it’s a sign that you are always on the go. That’s great leadership and I wish everyone in Nevis and St. Kitts all the best,” she said. Ms. Rybicka also extended best wishes for 2016 to the government and people of St. Kitts and Nevis.